This May is the one-year anniversary of one of the worst bounce house injury incidents in recent memory. In England, high winds swept a large bounce house off its moorings and carried it about 150 yards through the air while a 7-year-old was trapped inside it. Summer Blackie was rushed from an Easter celebration in Essex, which is about 30 miles outside London, to a nearby hospital, where she was later pronounced dead. 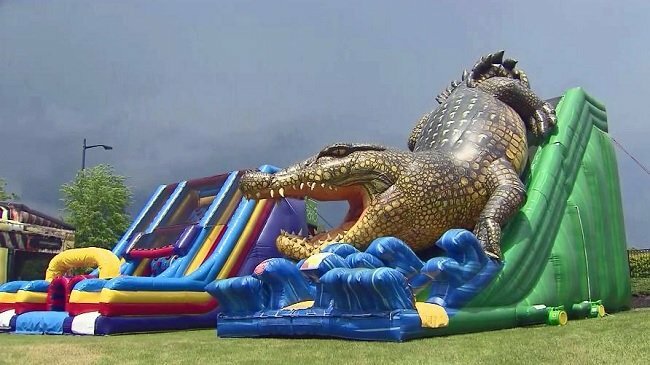 At the time, authorities stated that the people in charge of the bounce house failed to secure it properly, but there were also some concerns over the inflatable playhouse’s structural integrity. Less than a year earlier at that same park, several children were trampled when a bounce house suddenly and unexpectedly deflated. Inflatable playhouse safety has improved a little since 2014, when a national magazine first shed light on the ongoing bounce house safety epidemic. According to one study, thirty-one children a day received treatment in hospital emergency rooms because of bounce house injuries; the average victim was seven years old and had typically sustained either a serious fracture or a spinal cord injury. Bounce houses are much more popular than they were in the 1990s. Many inflatable playhouses are much larger than they once were. Their steep slides and extremely big play areas greatly increase the risk of serious falls and of children playfully careening into one another. While toy manufacturers make bounce houses bigger, they also make them from rather flimsy materials that are easy for parents to assemble. As a result, many advocates say that bounce houses are just as hazardous as backyard trampolines, one of the most infamous dangerous toys to ever come off an assembly line. Pass Without Objection: If the buyer expresses concern about a potential defect, the seller cannot insist that the buyer is worried about nothing. “Fair Average Quality”: Essentially, the good must be reasonably consistent with any written product description. Conform to Promise or Affirmation: Similarly, if the label makes any claim about the product’s safety, use, or whatever, the product must meet or exceed the expectations that the manufacturer creates. Fit for Ordinary Purpose: In this context, bounce houses must be able to accommodate lots of giggling children on a sunny afternoon, no matter what “warnings” the manufacturer affixes to the label. In a suit for damages against the manufacturer, the toy maker often hides behind the unintended use doctrine. This tactic is especially common in bounce house injury cases. In this context, the “unintended use” is essentially a failure to follow safety instructions. Many bounce house manufacturers routinely include safety warnings with their products, such as only allow one child at a time into the bounce area, do not set up the inflatable if winds are higher than 10mph, and so on. However, the manufacturer is still liable in situations that involve a foreseeable unintended use. The classic example is people who use screwdrivers to open paint cans. Even if the manufacturer warns people not to use screwdrivers in this way, they will still do it, so the use is foreseeable. Instead, the unintended use doctrine usually only applies if the product is used in a clearly unsafe and unforeseeable manner, something like using a gas-powered lawn trimmer to cut hair. If the jury determines that the manufacturer sold an unsafe toy, the plaintiff is entitled to significant compensation for both tangible losses, such as medical bills, and intangible losses, such as pain and suffering. Punitive damages are available as well, in many product liability lawsuits.